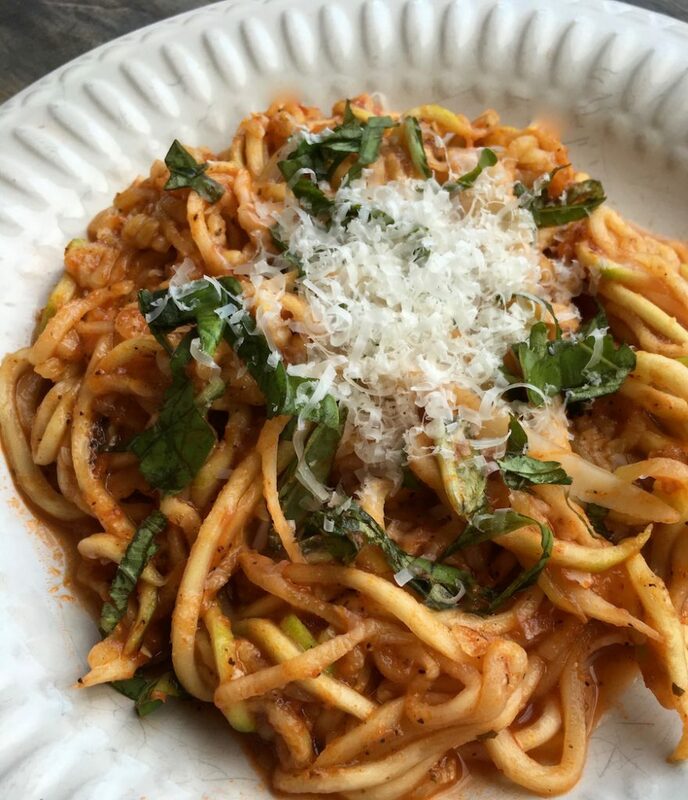 This Courgette Noodles with Arrabbiata Sauce recipe replaces traditional pasta with healthy and delicious courgette noodles, so you can indulge in it often without any guilt. 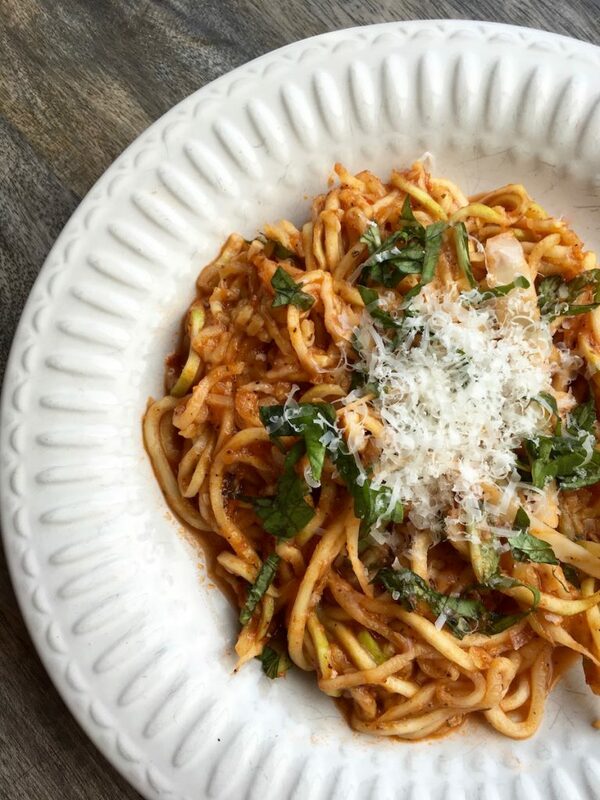 All’arrabbiata is a spicy Italian red sauce made with red pepper flakes. It is traditionally served with rigatoni or penne noodles, but here it is paired with crisp-tender spaghetti-like courgette noodles. 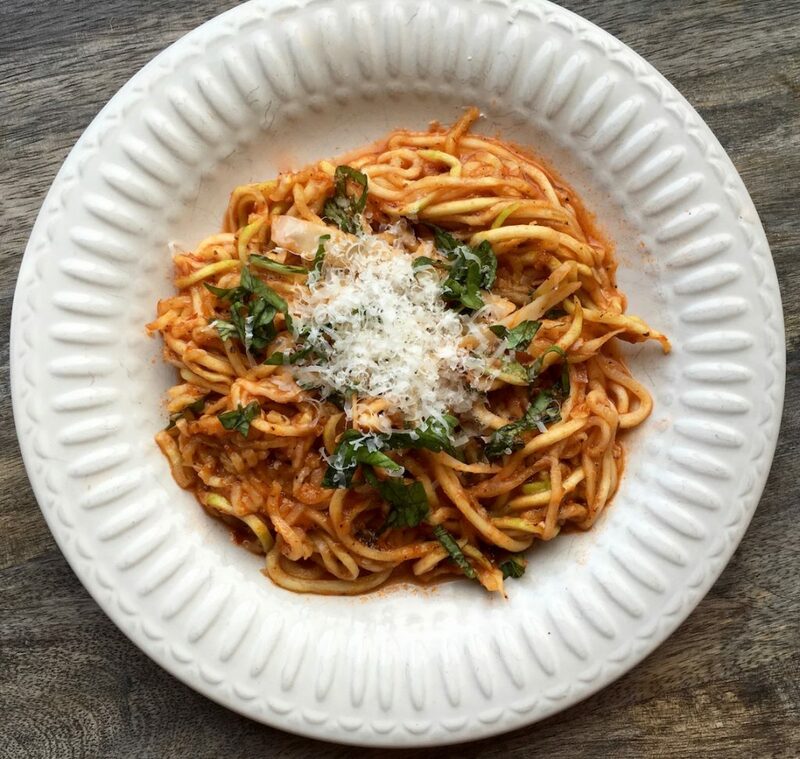 If you’d like to save a little time, you can use prepared arrabbiata sauce. However, you can make your own from scratch in less than half an hour or you can make large batches in advance and freeze the rest for easy weeknight meals. Special equipment: vegetable spiral slicer, such as the Paderno World Cuisine Tri-Blade Vegetable Spiral Slicer or the OXO Spiral Vegetable Slicer. While the sauce is cooking, slice courgettes into thin, long noodles with a spiral slicer. (If using the Paderno Tri-Blade Vegetable Spiral Slicer, use the small “shredder” blade to create spaghetti-like strands). Heat olive oil and garlic in a large frying pan over medium-high heat until the garlic turns golden brown, about 4-5 minutes. Reduce heat to medium and remove garlic from the pan with a slotted spoon or fork and discard. Add courgette noodles to the frying pan and sauté for approximately 2 minutes. While cooking, use tongs to flip the noodles to ensure they are warmed on each side. Season with salt and pepper, to taste, and set aside.